Guaranteed to turn heads, this is the beer that inspired a new generation of ale drinkers. 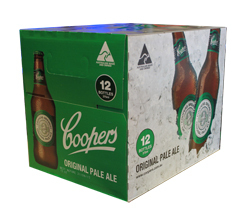 With its fruity character, and robust flavour, Coopers Pale Ale is perfect for every occasion. Naturally fermented in the 'Burton-on-Trent' style, a secondary fermentation creates the trademark sediment that gives 'Pale' its fine cloudy appearance. This cloudy residue can be stirred through the beer by tipping or rolling the bottle before drinking. Pale Ale has no additives or preservatives. A great South Aussie beer, get some down yer! What a beautiful, easy beer with loads of flavour. I could drink Pale all night/day long!